About "Absolute value in real life situations"
In real-world situations, we may choose to describe values using either negative numbers or the absolute values of those numbers, depending on the wording you are using. For example, if we have a balance of -$35 dollars in an account, we may also choose to represent that as a debt of $35. 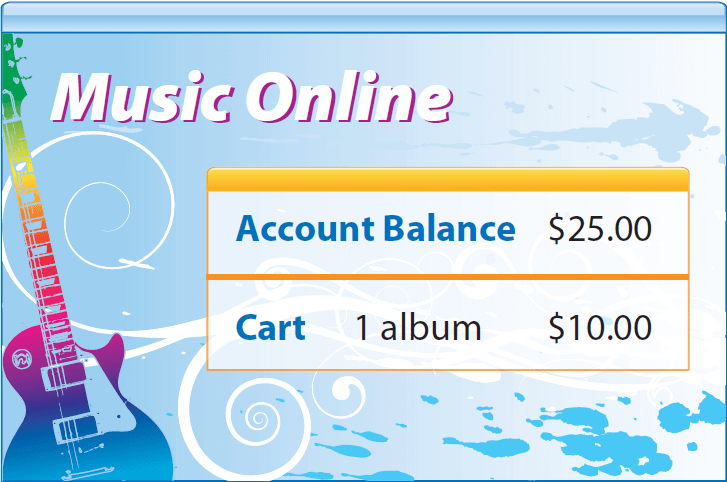 David uses his online music store gift card (given below) to buy an album of songs by his favorite band. Find the negative number that represents the change in the balance on David's card after his purchase. Explain how absolute value would be used to express that number in this situation. The balance is decreased by $10, so use a negative number. That is, the balance changed by -$10. Use the number line to find the absolute value of -$10. –10 is 10 units from 0 on the number line. The absolute value of -$10 is $10, or | -10 | = 10. Use the absolute value to describe the change in David's balance. The balance on David's card decreased by $10. You have the balance of $1500 in your bank account. You are withdrawing $500 for personal use. Find the negative number that represents the change in the balance on after withdrawal. The balance is decreased by $500, so use a negative number. That is, the balance changed by -$500. Use the number line to find the absolute value of -$500. –500 is 500 units from 0 on the number line. The absolute value of -$5000 is $500, or | -500 | = 500. Use the absolute value to describe the change in your account balance. The balance on your account will be decreased by $500. After having gone through the stuff given above, we hope that the students would have understood "Absolute value in real world situations".